The first exposure Evans Lumarc had to art was through his father, a wood sculptor. Lumarc learned the trade as he grew up, following his father’s example. At 15, though, he began painting for the first time and never looked back. After graduating from school Lumarc earned a living as a driver, eventually saving enough money to attend a private art school for eight years. It was there that Lumarc learned fundamental technique for landscape and miniature painting, and developed his distinct artistic style. 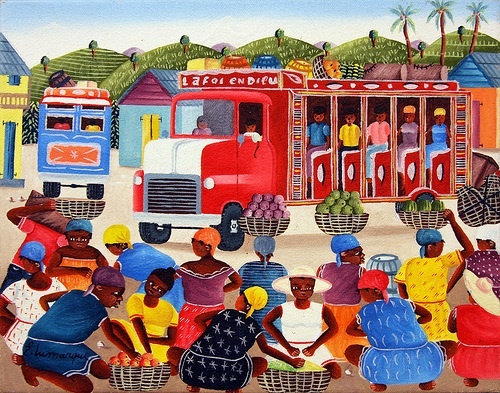 Now, Lumarc tends to paint busy market scenes, crowded with Haitians buying and selling fruits, vegetables, and crafts. His paintings often feature Tap-Taps, colorful Haitian mass-transit cabs—perhaps a reminder to Lumarc of his days as a driver. A prolific artist, Lumarc generally turns out about four paintings per month. His paintings are popular in contemporary Haitian and French galleries and art markets. Today Lumarc lives in Port-au-Prince with his two children.